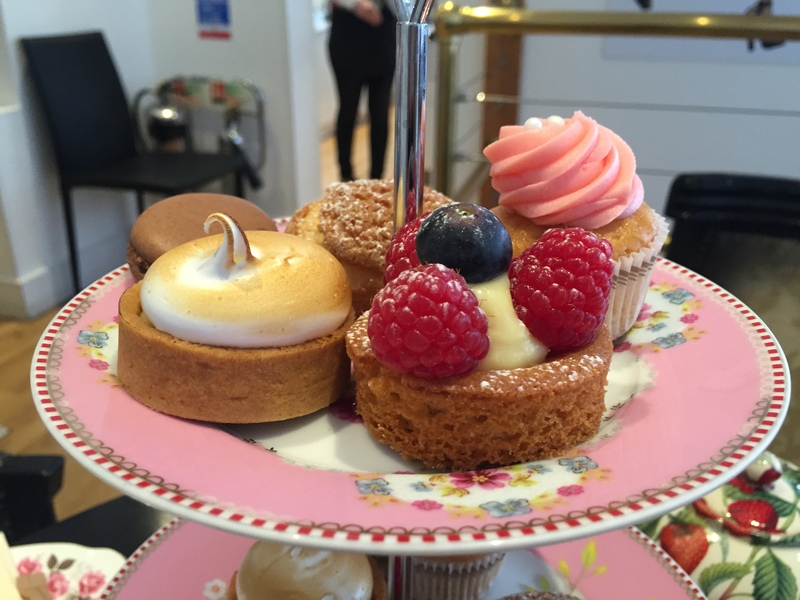 To celebrate Afternoon Tea Week (10-16th August – YES that exists! ), I was invited to try out BB Bakery’s halal afternoon tea and the BB afternoon tea bus tour! 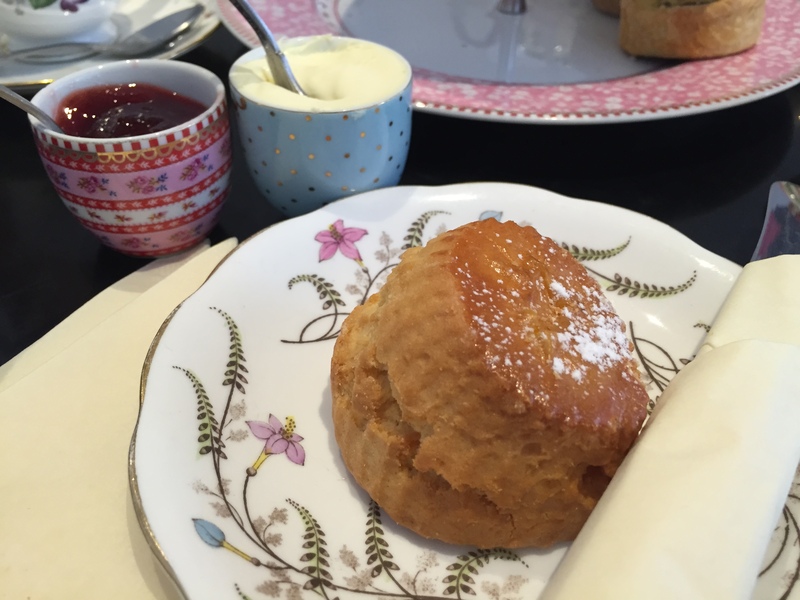 Finding afternoon tea in London is easy! But finding one that is halal, with pretty crockery and a lovely venue is hard to find, so I was extremely excited. The bakery has a simple, pretty and elegant Parisian vibe filled with friendly staff, cute decor and yummy treats! BB bakery is great for bridal/baby showers, a girly afternoon out and for the boys… if you take your wife here I’m sure she would love it! They also have private rooms available if you book in advance. Seated immediately, we were served with freshly squeezed orange juice and were asked what type of tea we would like. My friend M opted for their black tea and I opted for their red fruit tea: a mix of strawberry, raspberry, cherry and currant. 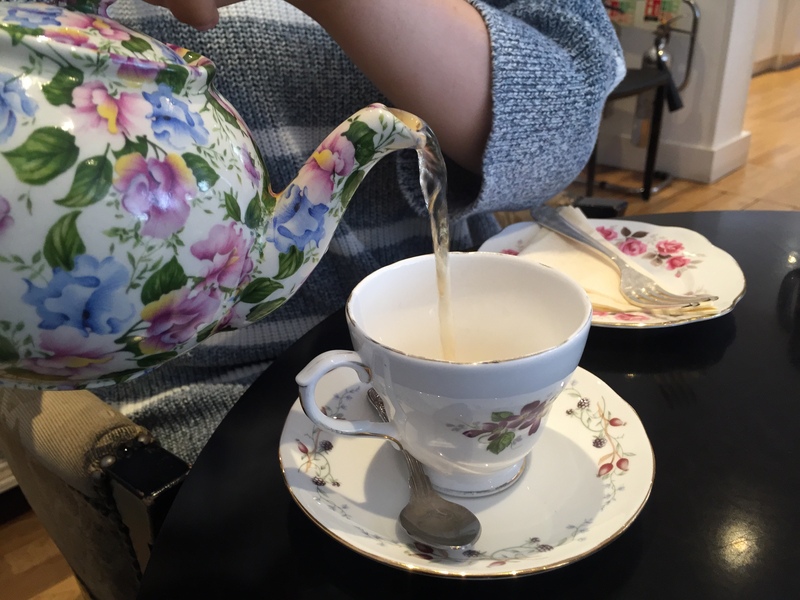 I thought at first my tea might taste too fruity because of its strong scent, however, it had a perfect subtle hint of fruit and was not too overpowering. This was one of my favourite sandwiches of the day. The addition of mint was very refreshing. I didn’t really like this sandwich and neither did M. The taste was a bit too overwhelming and left a bad aftertaste. A fluffy yeast pancake topped with a layer of cream cheese, a cucumber slice and smoked salmon. We really enjoyed this one! The flavours and textures went really well together. The filling of this tart was lovely, however, the outer part was too hard to break with our cutlery, and we ended up having a competition to see who could break it in the most lady-like manner. In the end we succeeded, however, we were too impatient to continue and ended up eating it with our hands. I really enjoyed this fruit tart. The outer part was softer than that of the lemon meringue and it had a delicious vanilla filling. This was my favourite dessert of the day! This had the same filling as the fruit tart. It would have been nice to have something different, however, I did enjoy the filling so I can’t complain much more. I LOVE cupcakes! This was nice but not amazing and definitely not comparable to other cupcakes I’ve had! You must know from our Instagram account that I love macarons too! Chocolate is one of my favourite flavours and I thought I’d leave the best till last. Despite its delicious chocolate flavour, BB bakery’s take on it was a bit too chewy for my liking and I don’t think they have perfected it. Okay, so you’re feeling full and fat in spite of having a light lunch, to prepare for your afternoon tea. Warm scones, which I topped with generous helpings of clotted cream and jam, are delivered to your table upon your request. They give you a fuzzy feeling in your stomach and are freshly baked. A great way to end our afternoon tea. 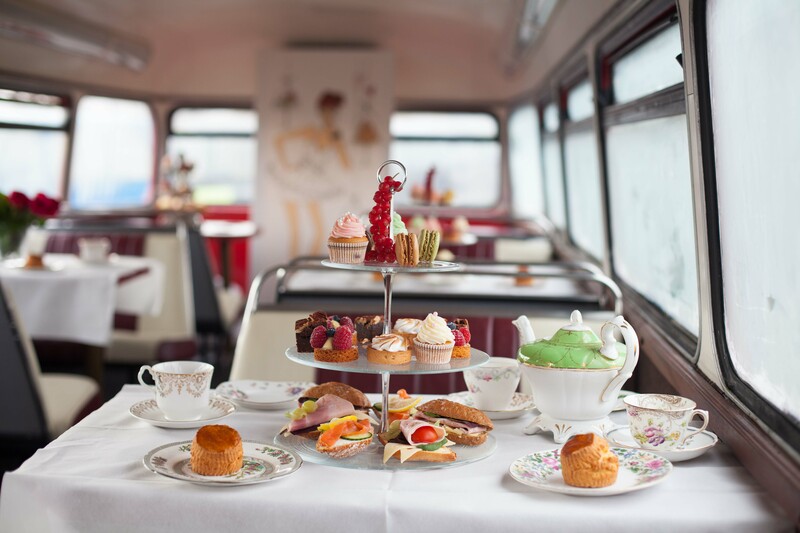 I think the idea of having afternoon tea on a Routemaster is unique and great! 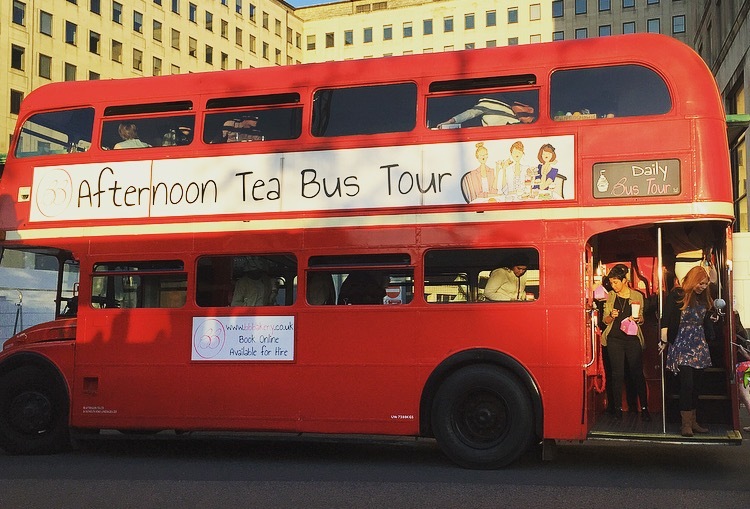 The vintage bus drives around Central London, passing some of London’s greatest sites! It’s perfect for tourists and a great novelty for locals. I was told in an email that the bus would be departing at 5.15pm. My friend IA and I arrived at the pick-up point at 5pm only to find that we were the only ones there! Confused, we rang the bakery and were told that they forgot to inform me that the bus would be departing at a later time – 6pm. Talk about bad luck! This was extremely inconvenient as we now had about a whole hour to spare with nothing to do. Considering this was the second time the company had messed up, I was really disappointed. In the end, the bus arrived at around 5.50pm and we departed on time. The bus was well decorated and our afternoon tea was set up and ready for us! All of our plates and trays were cleverly attached to the table so that nothing falls as the bus moves. The service on the bus was great and a book with a little history of each of London’s sites was present on our table. One of the waitresses also pointed out monuments as we passed each one. 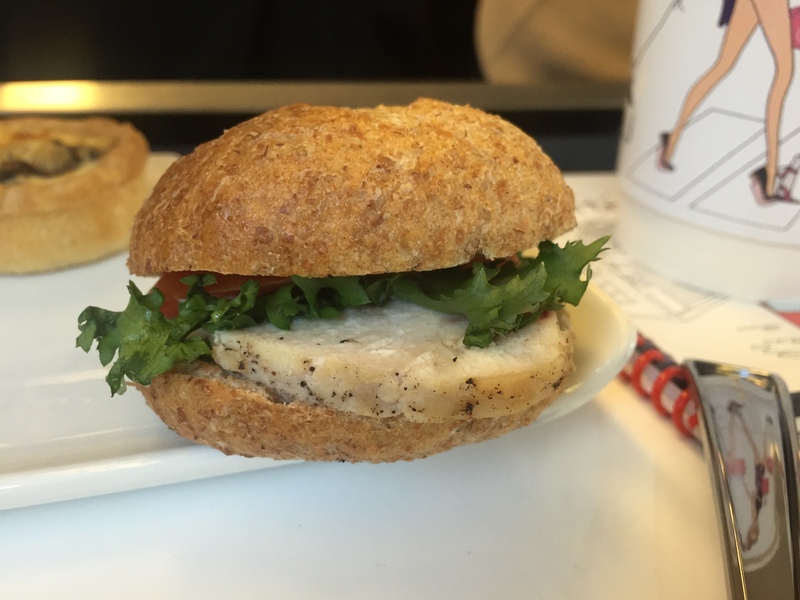 The sandwiches and pastries served on the bus were the same as those served at their bakery, with the exception of one tomato and cream cheese bun being exchanged for a halal chicken, tomato and lettuce bun with mayonnaise. This naturally became my favourite sandwich! The chicken and the bun were fresh and delicious and I wished there was more than one! I was left disappointed that only one item out of all the foods they served was halal. At the end of the bus tour, you are allowed to keep a cute cup and can take any leftovers home in a girly pink goody bag! Brigitte Bloch has set up a unique company that offers halal afternoon tea not only at a bakery but on a bus, boat, as a picnic and also offers to deliver to your work/home. 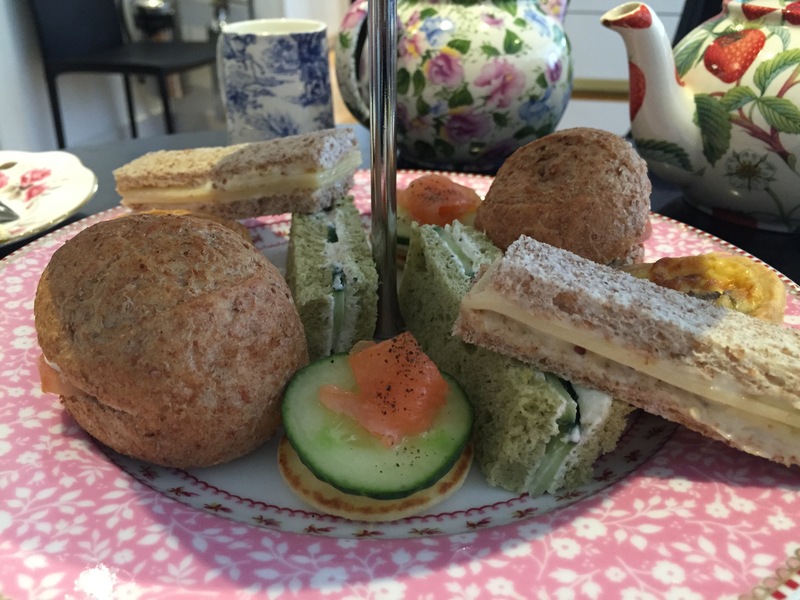 Overall I did enjoy BB’s take on afternoon tea, however, I didn’t think it was amazing! It’s a shame that mistakes were made on both occasions, because aside from these mishaps, the waiters were attentive! Considering the price, it is important that errors like these are not made in the future. 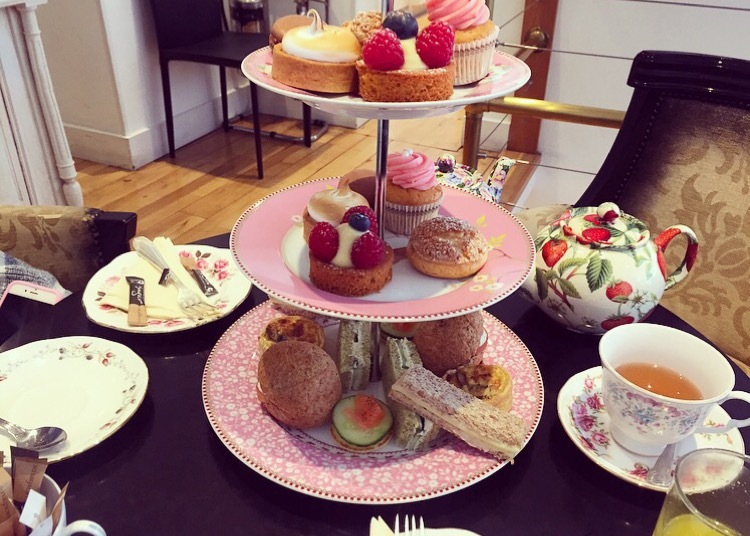 I am not sure if I would pay for their afternoon tea, but if I am ever in Covent Garden I would definitely go back to their lovely bakery for a cup of their red fruit tea and a fruit tart (or two)!